They are boxes... which kinda look like pillows once you pinch the sides and pop them into shape. They make great wrapping for any occasion, such as wedding favors, baby or bridal shower favors, or other small gifts like candy or gift cards. You can purchase plain white pillowboxes in bulk at a craft store or OrientalTrading.com. One piece of 12x12" scrapbook paper was more than enough to decorate two boxes and I used some of the scraps to create coordinating gift tags. Ivory satin and organza ribbon leftover from my wedding added the finishing touch. 1. Measure the length and width of the pillowbox. Cut a piece of scrapbook paper so that the width is about 1 cm less than the length of the pillowbox and the length of the paper is 1 to 3 cm greater than twice the width of the pillowbox. Measurements do not need to be exact, just close. From the leftover paper, cut a second piece the same size for your second box and hang on to the leftover scraps until step three (3). 2. Wrap the decorative paper around the pillowbox lining up one edge with the edge of the box. The box should be completely wrapped, plus a little extra. 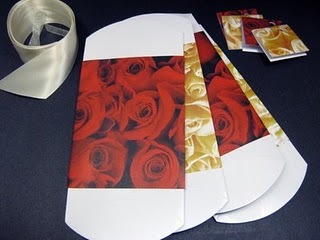 Crease the paper in two places where the pillowbox is creased, then secure the paper in place with double-stick tape. The extra lenth on one end should be taped underneath the opposite edge which is aligned with the pillowbox edge. Repeat this for your second box. 3. From the paper remnants cut two pieces of paper which are about 1.5" x 3". Fold each in half and punch a hole in one of the corners near the fold. 4. Thread a piece of thin organza ribbon through the hole in the gift tag and tie a knot to join the ends in a loop. Repeat on the second gift tag. 5. Pinch the pillowboxes into shape and fold down the curved edges. Insert gift card or candy (or other surprise!). 6. Tie a wide satin ribbon around the pillowbox to secure the ends. 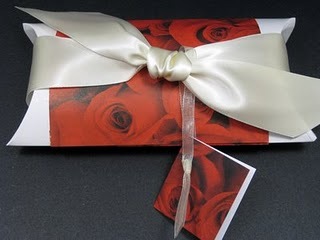 First tie an overhand knot, then slip the looped ribbon on the gift card over one end of the satin ribbon. Finish tying the satin ribbon in a bow or double-knot. Repeat for the second pillowbox.